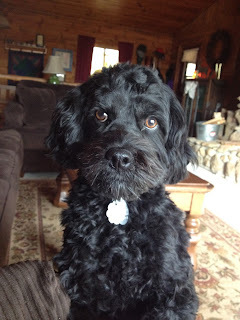 Our youngest grand dog is a cockapoo named Bandit. Bandit came from the same breeder as his cousin Piper, but he only weighs 14 pounds. Piper is almost twice as big. Bandit is a lively little thing, but is also sweet as can be. Yesterday wasn't a good day for Bandit. Our grandson brought a dish of semisweet chocolate chips into their computer room. He was snacking on them. When he left, he forgot the chips. Yes, you guessed it. 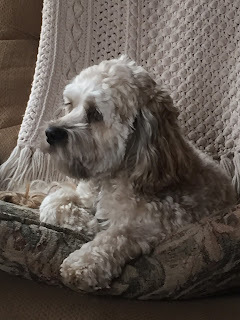 Bandit climbed up on the chair and ate the remaining chocolate chips. Chocolate is toxic to dogs and the darker the chocolate, the worse it is. It was only a half hour or so before they discovered it. My daughter knew she had to make him throw up. She talked to a neighbor who had recently had a similar experience. She told her to give him hydrogen peroxide and how much to use Within a short period of time, Bandit threw up a lot of chocolate. He seemed ok, but then threw up again. We all thought that would be the end of it. It was not. By 10 PM, the dog was starting to tremble and wasn't doing well. Since it was so late, they had to call an animal hospital about an hour away because all the local veterinary clinics were closed. The veterinarian told her to bring him right in. When they got there, his heart rate was at 170, and they admitted him to the hospital. He had a rough night. They gave him sedatives, fluids and monitored his heart rate. They also gave him charcoal. By the middle of this morning he was doing better, but they wanted to keep him for a few more hours. Now he is home. He has to be on a special diet of chicken and rice and has to have probiotics. We checked on him this afternoon, and he seemed pretty much himself although he was a little tired. We are all so relieved that tonight he is almost normal, but last night was a long night of worrying. The vet said if they hadn't made him throw up, it may have been a very different story.